Touchscreen controls under tempered glass, multiple storage compartments – including a fridge – and numerous USB charging ports. Is this the perfect table for the modern age? Face it. We live in a world of the evolving smart home. We also live in a world where we love being couch potatoes. The good folks at StoreBound understand my – sorry, our – needs and have worked accordingly. Its latest foray on Indiegogo is the SoBro: A coffee table that does so much work for you that you don’t have to move. Ever. 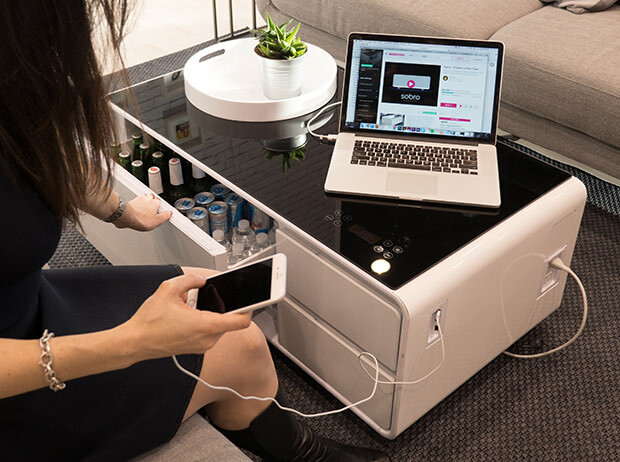 The SoBro is a smart coffee table. That’s the easiest way to put it. It’s outfitted with a refrigerated drawer, Bluetooth speakers, charging ports and LED lights. According to the campaign notes, SoBro aims to be the greatest living room invention since the remote control. Externally, it looks like any ordinary white coffee table with a black glass top. But the similarities end there. One side of the table is separated into three drawers. Two regular storage compartments and a primary drawer that also serves as a refrigerator. This helps keeps food and beverages chilled and within reach, saving you precious few steps to the kitchen and back. There’s a built-in compressor that allows for this feature and further control is possible as per personal preferences. There are also Bluetooth speakers embedded on two sides of the table. These connect to your phone or TV, bringing the noise to you. Multicoloured LED lighting under the table helps further set the mood for whatever occasion you’re having at home. If you thought the tabletop was ordinary, it isn’t. The glass is tempered, so you don’t need to worry about stains or cracks. It’s also gone a step ahead and includes a touch control panel. You can control your Bluetooth preferences, refrigerator temperature settings and the underside lighting. As you can imagine, this table comes with its own power cord. It’s simple plug-and-play and you’re ready to go. Before we forget, there are also USB and power ports on the table so you don’t have to go too far to charge your phone, laptop or anything that requires charging. There are two of each on one side of the table, meaning there’s plenty for everyone. This connected piece of furniture starts at $499 (Dh1,830) and is available on the Indiegogo page. If the goals are met, wood and black variants will be made available in addition to the standard white shade. Pledge now and expect delivery to start sometime towards the fourth quarter of this year.